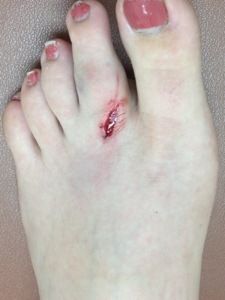 So my friend and I were trying to move a tv and accidentally dropped it on my foot. I ran to my nurse roommate who dumped hydrogen peroxide into the wound and we called it a night. When I woke up the next morning, I freaked at how bruised and nasty it was, so me and nurse roommate took a field trip to a mediquick. The point of this blog post is not to talk about my doctors visit, but let's just say it could have gone way better with a lot less judgement. Fast forward a few hours. I'm sending a picture of my war wound to everyone, even my Mary Kay director (she asked for it). Then she shows her doctor husband, who offers to help. It's 1045 at night and I have never met him before. Obviously I want to put my toe in the best possible environment to recover, so I go. He cleans it up, gives me a few tips, butterflies it up, and sends me on my way. I sell (well try to) Mary Kay under the direction of his wife for less than two months and he is putting my foot back together on his off time. If that kindness and generosity does not perfectly explain how everyone wants to be treated, I don't know what will. To know that there are people out there like that gives me a lot of hope for the world. It's also why I'm falling for Mary Kay. I definitely didn't join Mary Kay for the medical benefits (there typically arnt any) but it's one of the reasons I am re energized to stay. Not the fact that it connects me with doctors, but that the network it creates takes care of one another. Not successfully selling makeup in a makeup industry is pretty demotivating, but to know that the people I'm surrounding myself with are actually fantastic humans keeps me going. Selling makeup might seem trite, but being immersed in a culture of giving and genuinely helpful people is not. Having people that care about you beyond just numbers is what sets Mary Kay apart from other multilevel marketing companies. Despite being an independent contractor and basically only having minimal responsibility for me, my director went out of her way to help me and demonstrated an unparalleled level of compassion outside of the job related requirements. That's why I'm proudly staying with Mary Kay.